Cubic Corporation (NYSE: CUB) has announced that their Cubic Mission Solutions (CMS) business division's GATR satellite antenna systems will proceed to Full Rate Production (FRP) for the U.S. Army's Transportable Tactical Command Communications (T2C2) program. Photo of Cubic's GATR Antenna deployed to St. John. T2C2 was granted approval for FRP as a result of the T2C2 Full Rate Production Milestone review. The FRP decision will enable the Army's program office to procure and field Cubic's GATR satellite antenna systems to Army units. 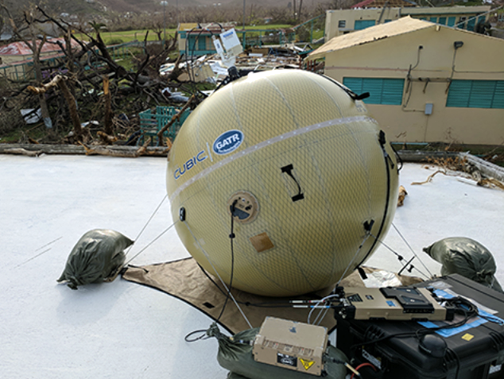 The GATR 1.2 meter and 2.4 meter inflatable satellite terminals provide high-bandwidth network communications and mission command for initial entry and sustained forward operations. The terminal's compact size and innovative design provides significant improvements in transportability, bandwidth and set up speed, providing essential communications when and where they are needed most. The GATR satellite antenna system's inflatable feature allows it to provide a larger dish size in similar transit volume and weight compared to a traditional rigid dish, with increased capability and bandwidth efficiency. Mike Twyman, President of Cubic Mission Solutions, indicated that the company's team worked hard to ensure that GATR satellite systems would offer transportability, high-bandwidth capabilities and ease of set up for Army units as they go into battle. The company's expeditionary solutions will provide confidence and peace of mind for customers' next missions.